"You know Rabi Bhawan? Yeah? How much?" We walk away. "Ok sir, how much you pay?" And the bargaining begins. I hate bargaining but even I will almost never pay the starting price a cab driver gives me. Phrases like "that's good price," night price," "I lived here," and "it's so close" follow. Walking away really seems to be the key. 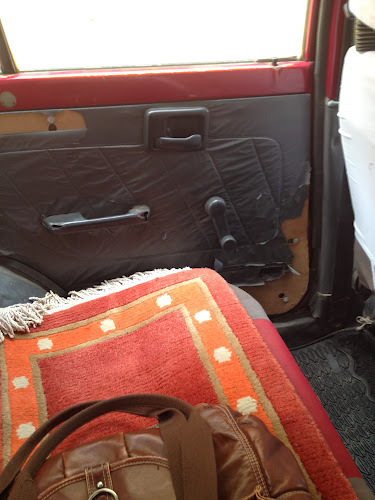 Kathmandu's cabs are small (even my knees hit the seat in front of me), white, the inside often looks like the cars been partially stripped, and each backseat comes complete with a rug of sorts - the function of which I am unsure (comfort? - no, they are scratchy and always bunch up; cleanliness? 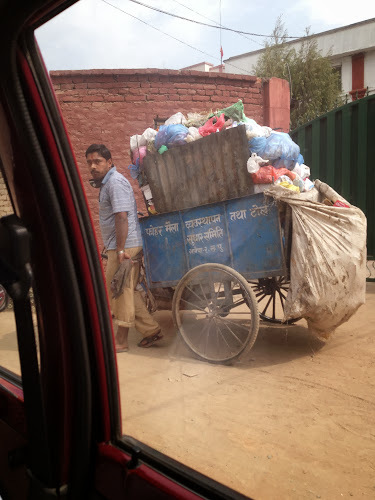 - perhaps some desperate attempt to either prevent more dirt or a way to spiff up the environment a bit). Often the driver has added his own touches to the dash: a statue of a god, some solar-powered tchotchke, burning incense (my least favorite) and one even had grass growing! These cabs are anything but nice. Ironically cab drivers while waiting for customers are often wiping off the dust from their cars. Added to the lack of comfort in the car itself is the condition of the roads. Bumpy is putting it mildly. Roads are torn up, ridiculous speed bumps everywhere and many roads just aren't paved. I hit my head on the roof and sides of the car regularly. 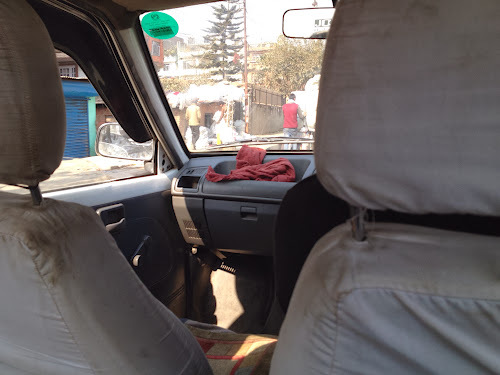 And the pièce de résistance of the Kathmandu cab experience: the horn. Basically it doesn't stop. It's used to communicate "move out of my way," "I'm coming through," "passing on the left," "passing on the right," and sometimes I think maybe the cab drivers just like the sound of it. The upside of cabbing it in Kathmandu is when you then get in a car in another country you really appreciate it.